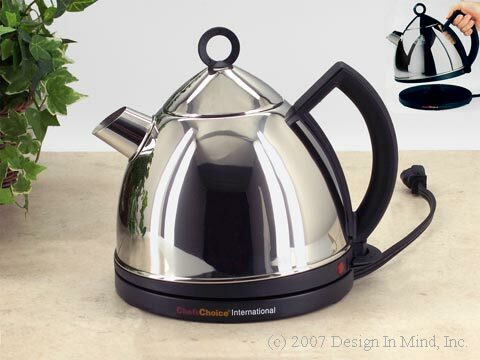 Cordless electric kettles... fast water boiling and contemporary design. Chefs Choice cordless electric kettles, stainless-steel and glass, boil-dry shutoff protection, kettle lifts from corded base. 1.75 quart (56 oz.) Cordless Electric SmartKettle from Chef's Choice. 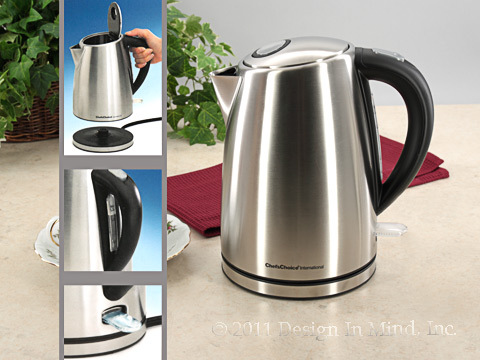 Sleek, cordless stainless-steel kettle with corded power base unit. Advanced digital controls allow you to preset the temperature to your liking. Patented digital temperature controls with + 2 degrees accuracy. Holds water temperature for up to 40 minutes. Stores the last temperature selected. Sensors alert you when water is low. Easy-read LED F/C temperature display. 7 1/4" D x 10 1/2" H. 110-120 AC Volts. 1,500 Watts. 1.75 quart (56 oz.) 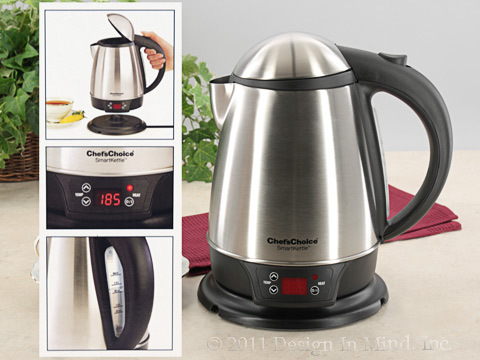 Cordless Electric Kettle from Chef'sChoice. Compact lightweight design with brushed stainless-steel carafe. Visually appealing for elegant dining or casual meals. Single-handed, push-button lid operation for easy filling and pouring. Concealed heating element eliminates mineral deposits for clean-tasting water. 1,500-watt power to boil water faster than stove top or microwave. Safe, cool-touch base to serve this kettle on the table. Water level gauge built into the handle. Automatically shuts off when water boils. In-base cord storage with 27" L cord. 6" D x (8" w/handle) x 8 3/4"H.
Hand wash and dry thoroughly after washing to preserve finish. Chef's Choice® Deluxe Cordless Electric Tea Kettle. Polished 18/10 Stainless Steel Finish. Stay-cool handle. Cord stores neatly in base and adjusts to desired length. Heating element is never in contact with the water, so there's no build-up of mineral deposits on it. "On" light shows when unit is operating. Convenient on-off switch. Automatic shut off when water boils. 1.33 quart (45 oz.) capacity. 1500 watt heating element. 10"w x 7.75"d x 8"h. Model 685.